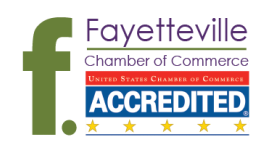 Welcome to the Fayetteville Chamber of Commerce website! I am extremely proud to serve as the President/CEO of our chamber. I believe with conviction that Fayetteville is one of the greatest cities in the United States in which to live, work, and play. Our site highlights and promotes Fayetteville as a city of innovation, character and ingenuity. Follow our links to the services, facilities, programs and individuals that will permit you to enjoy Fayetteville, the Athens of the Ozarks. On this site you will find information about our outstanding healthcare facilities, a description of numerous venues for entertainment, shopping and dining and let’s not forget our top notch educational institutions. The University of Arkansas is home to more than 26,300 students pursuing undergraduate, graduate and professional degrees. Over the past 4 years the University has invested in this flagship campus more than $400 million dollars to provide new and remodeled classrooms, lecture halls, science and nano-technology labs, honors halls and performance venues. Fayetteville’s new $93 million dollar LEED certified high school stands as testimony to the fact Fayetteville citizens believe education is tantamount to success. Fayetteville has been chosen as one of the U.S’s 100 best places to live and one of the 10 best college towns in the country. We invite you to Fayetteville to do business, to live, to play and to learn.